Kristen Jarvis, the special assistant for scheduling and traveling aide for First Lady Michelle Obama, refers to Michelle as her “big sister.” This 28-year-old woman is the reason Mrs. Obama always looks calm and collected. Jarvis even prepared Michelle for the campaign trail last year, telling her what to pack, item by item, down to Oreo cookies and hand sanitizer. Kristen Jarvis is a graduate of Spelman College, a prestigious historically black women’s college, located in Atlanta, Georgia. She has been with the Obama family for five years, giving her a unique advantage to help the first lady in every way possible. Jarvis even tried to make the transition from Chicago easier by introduced the Obama family to some of her favorite restaurants in Washington, D.C.
“Change is good. 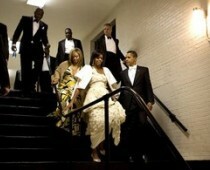 She’s very low maintenance,” Jarvis stated, referring to the first lady. Kristen Jarvis agrees that the hours of a White House special assistant are long, but emphasizes that the Obamas have become like her new family.